Johann Georg Schleiger was born in Norka, Russia on March 8, 1857, the son of Heinrich Schleiger (born 1823) and Anna Margaretha Müller (born 1824). Johann Georg (George) immigrated to the United States in 1878 and initially settled in Nebraska. There he met Elisabeth Sittner and they were married in Sutton on January 16, 1881. Elisabeth was the daughter of Conrad Jacob Sittner (born 1836) and Katharina Huck (born 1836). Three sons were born in Nebraska; John Frederick (born April 1881), Georg John (born September 10, 1883), and Henry (Harry), who was born on December 23, 1885. ​By 1891, the family was living in Albina. A fourth son, Frederick, was born there on August 18, 1891. George was the paternal first cousin of Henry D. Scheicher, another early Volga German settler in Portland. It is possible that they traveled to Portland together. In 1892, the Schleiger's were residing on Montana Avenue, 3 lots north of Fremont and George worked as a laborer. In 1893, the family was living at 440 Russell Street. In 1900, the family living is residing at 252 Eugene Street in Portland. George is listed as an oil dealer. George's sister, Anna Maria (Emma) Schleiger (born February 11, 1849), came to Portland in 1900 with her husband, Conrad Blum. George and Elisabeth's son Frederick died on August 14, 1902 and he was buried at the Lone Fir Cemetery. 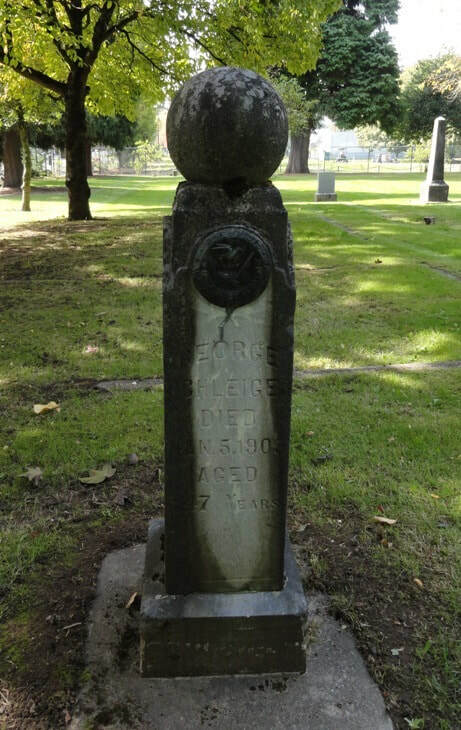 George Schleiger died on January 5, 1905 and was buried at the Lone Fir Cemetery. Elisabeth died sometime between 1906 and 1910 in Portland. ​Lone Fir Cemetery website (March 2018).